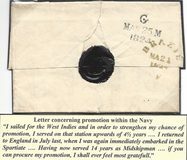 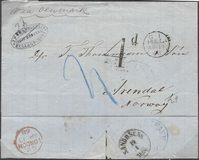 1869 Wrapper from Hull to Arendal (Norway), postage prepaid, showing a very fine HULL/SHIP-LETTER circular datestamp, Robs S 14. 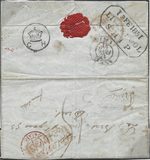 1848 Cover from Leghorn to London "par Pachal" showing a fine SOUTHAMPTON/SHIP-LETTER, Robs S 12, in Blue. 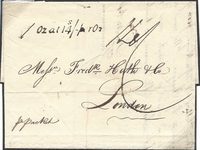 1840 Cover from Guernsey to London "Pr Sophia" charged "8" and showing a very fine SHIP LETTER/GUERNSEY, Robs S3, in RED, GC 9 - RARE. 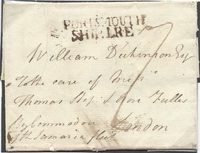 1840 Large part cover to London showing a very fine BRISTOL/SHIP LETTER in Red, Robs S 8. 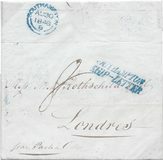 1875 Entire from Manchester franked by a 1/- Green, SG 150, Plate 11, and addressed to VENEZUELA "PER R. M. Str/TASMANIA. 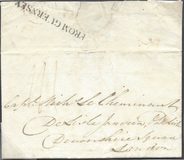 Manchester datestamp shows '57' for '75'.